Internationally renown teacher and author, Mike Hoseus is coming to the Lehigh Valley to teach on the topic of Executive Lean Business Applications and Leadership’s role in sustaining a Lean culture. This two-day event is all about how to develop yourself and your organization into high-performers that can deliver sustainable business results. Leadership is the most frequently identified gap in organizations striving toward world class excellence. This comprehensive workshop will explore the role of leadership in a culture transformation, facilitate identification of gaps in your organization and then give practical methodologies and processes to address them. Mike is Executive Director for the Center for Quality People & Organizations (CQPO). Mike Hoseus brings both manufacturing operations and specialization in Human Resource experience to CQPO. CQPO is an organization developed in 1999 as a vision of Toyota Motor Manufacturing to share Lean Quality philosophy and human resource practices with education, business, and community organizations. CQPO’s current projects with Toyota include New Hire selection and training process, Team Leader and Group Leader post promotion training, Quality Circle Leader and Manager training, and Global Problem Solving for all levels. Mike is an adjunct professor with the University of Kentucky’s Lean Manufacturing Program. 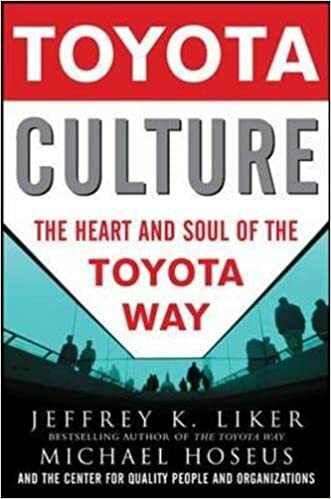 Mike is co author with Dr. Jeffery Liker (Author of the Toyota Way) of Toyota Culture. Mike is an adjunct professor with the University of Kentucky’s Center for Manufacturing and a member of the faculty of Lean Enterprise Institute. Prior to CQPO, Mike was a corporate leader for 13 years at Toyota Motor Manufacturing’s Georgetown, Kentucky, plant both in Human Resources and Manufacturing. As Assistant General Manager in Human Resources, his responsibilities included personnel, safety, HR development, employee relations, benefits, training, and manufacturing/human resource teams for a plant of 8000 team members. Mike currently supports organizations with Lean Culture transformations focusing on the roles of Executive Management and Human Resources and how the quality people value stream connects to the production value stream.